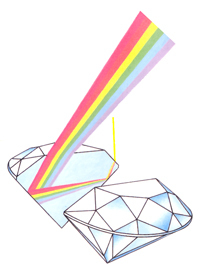 The brilliant colours displayed by Opal and Labradorite and the sparkle of Diamond are optical effects caused when white light is split into its constituent colours. In Diamond especially, and in many other transparent gems, the ‘Fire’ and sparkle is caused by dispersion as the gemstone acts like a prism. In Opal, this is caused by the light being scattered as it passes through planes of regularly spaced voids between the transparent silica spheres. Light is scattered by uniform spaced planes of voids between silica spheres. The colours are the result of interference and the range of colours depends on the distance between the planes.